Two weeks, I posted my fifteenth garage sale post, wherein I recalled finding what appears to be a reproduction Emeralite– one of my neatest finds this year. One of my favorite things about going to garage sales and thrift stores to find picks like these is researching these items’ history and cultural importance. So over the past few weeks, I’ve been researching this banker’s lamp and wanted to share some of the fascinating information that I’ve found. The Banker’s Lamp is an iconic style of electric table lamp characterized by a brass stand, green glass lamp shade and pull-chain switch (though modern versions may make use of alternate switch types). Other examples feature amber-colored glass. On May 11, 1909 McFaddin’s patent application for “a new, original and ornamental design for lamp shades,” was approved. Emeralite lamp shades were produced by the J. Schreiber & Neffen factory located in the city of Rapotín, Moravia. They continued production for 50 years. 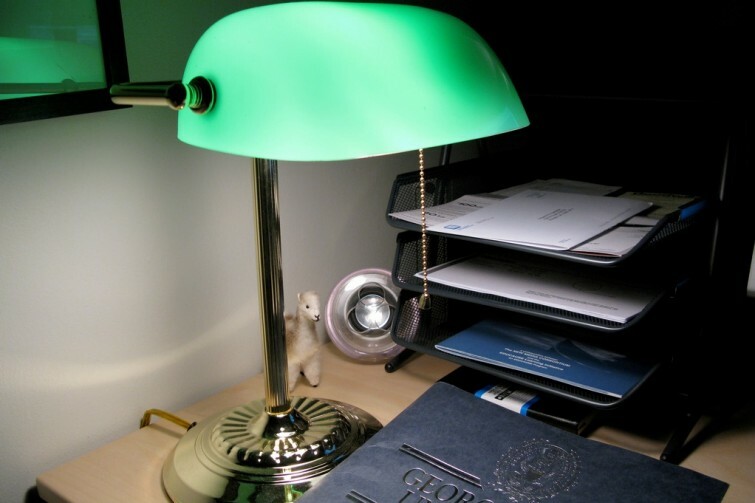 Essentially, the Emeralites that are today most easily identifiable, collectible and with which the name Emeralite is most readily associated, were simply brass-based or brass-plated desk lamps with green-over-white cased glass shades. These desk lamp shades are substantially flat on the sides and the back and gently slope toward the viewer in the front. However, the shades have no sharp corners; rather, the angles are all essentially rounded. Using the cased glass technique, the shades were made of white opal glass on the inside with a layer of “green” or other colored glass on the outside. Green was and still is thought to be psychologically soothing and so its use in a work space encourages calm focus and concentration. In fact, at the backstage of a theatre one might find a “Green room” which has the primary purpose of calming actors’ nerves before going on-stage. 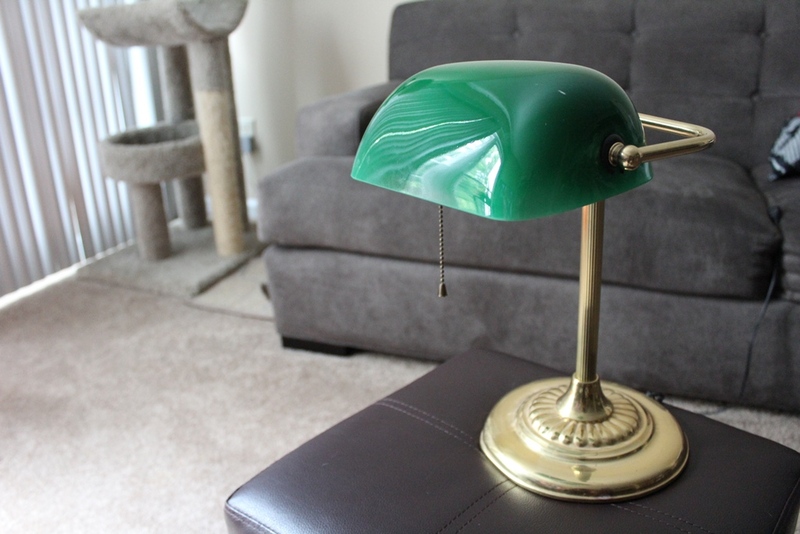 When I purchased my Emeralite-style lamp, I was under the impression that they were primarily used in libraries or in the offices of financial advisers. However, models included lamps for desks, beds, floors, adding machines, side chairs, draftsman’s tables, typewriter tables and many other uses. Lamps were also available with optional removable inkwells, pen holders and pens, clocks and calendars. The lamps with attached inkwells that I’ve seen are absolutely stunning and usually are priced very high. For more features like these, check out the vintage gadgets category right here on Retro Chronicle. If you happen to own an Emeralite, let me know what you think of it in the comment section. Which is your favorite model? Do you still use it and what for? I’ve had one for almost as long as I can remember. I’m pretty sure it came from my grandmother’s house after she passed away. I also got a furniture set that included a desk, so the lamp along with it makes sense. I always suspected there was some history to this lamp because I would often see very similar models, if not the exact same lamp, used as props in movies and TV shows. It was not until today, when I was writing a scene for a story in which I had a character pick up a lamp with which to defend herself from an intruder, that I ever looked it up. This lamp immediately came to mind (because it’s so heavy and would make a great weapon) and though I’d never heard it, I figured there must be a name for the model. Thanks so much for the awesome information. That was exactly what I was looking for.